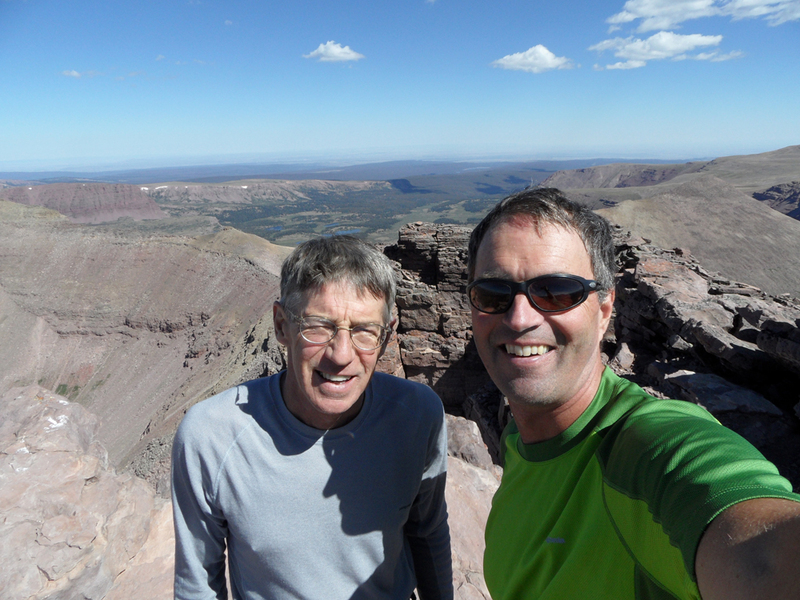 Bob and I revisit King's Peak, plus a neighbor. 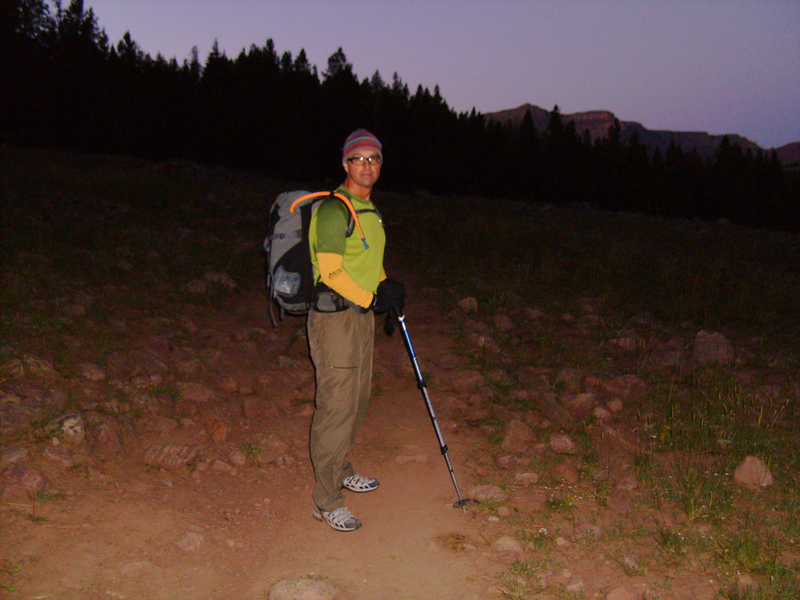 I had climbed King's Peak with Julie back in 2003. But Bob had not yet done King's. He and I have been slowly doing state highpoints together, so when he asked me to join him for his highpoint of Utah, I accepted. After all, as I learned on my previous trip it's a really beautiful area. That's the benefit and beauty of such a list- it gets you to try things that you might otherwise have ignored. We rolled out of Boise at a leisurely 9am for the seven-hour drive to our campsite at the Henry's Fork trailhead/campground. Considering that it takes almost four hours to get to the Lost Rivers, this isn't such a bad drive. Especially with Bob at the steering wheel. The next morning, we were up at 3 and after a few cups of coffee, walking at 3:45. Around 6, we were past Elkhorn Crossing and into the upper valley. Shortly after that it was finally light enough to turn off the headlamps. This pic also shows a bit about the trail. It is mostly pretty good, but wear and tear from heavy use has exposed lots of roots and rocks, real toe-stubbers. In retrospect, our approach shoes were probably a bit light, especially when we had to deal with the dreaded marsh section (yes, we got wet feet). King's Peak is in the center here, lit by the sunrise. 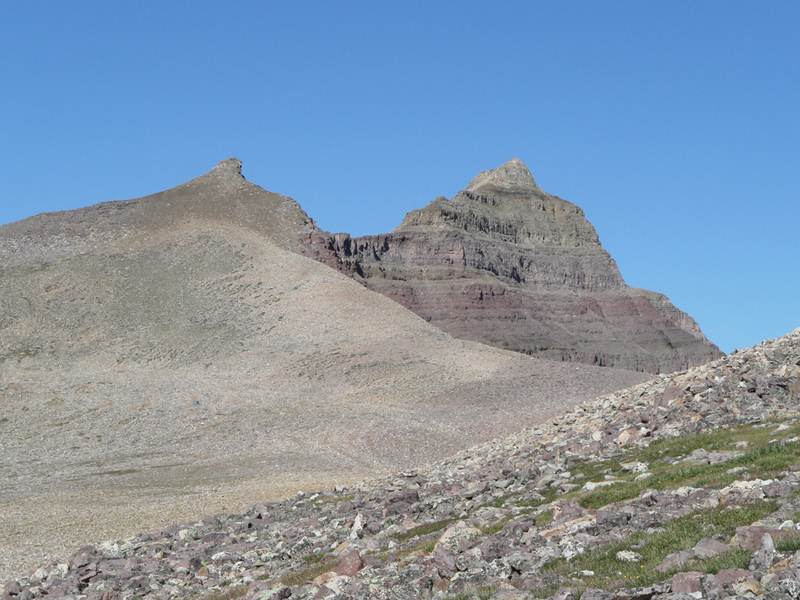 We would be climbing via Gunsight Pass, the notch on the left. 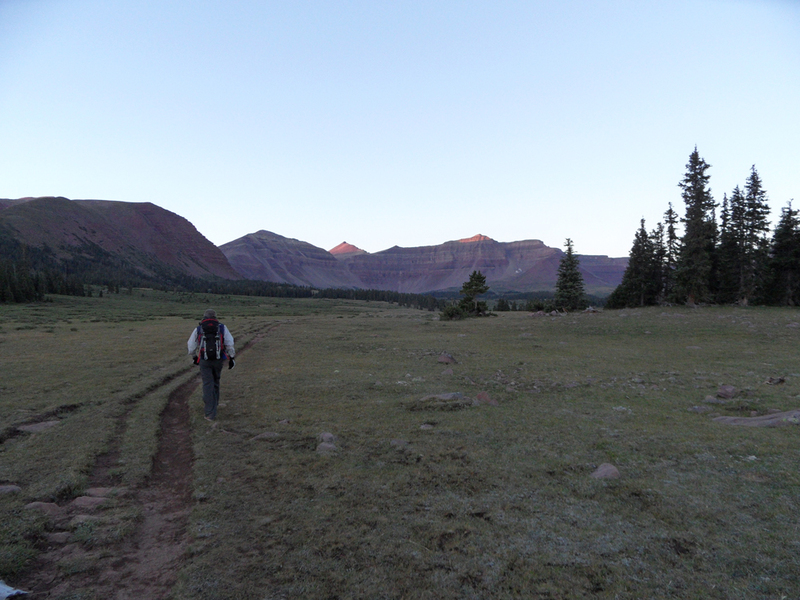 When we got to the foot of the pass, the sun was still not fully up. They had moved the trail since Julie and I were here, and being sleep-deprived, this caused me to slip into a bit of a brain cloud. But on the other side of the pass, it was all sunshine. 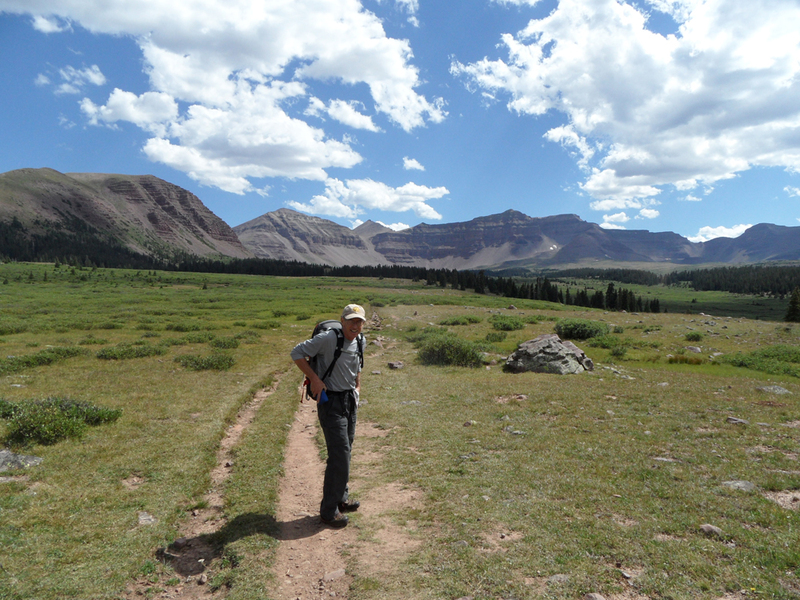 This is Gunsight Peak in the background, Bob in the foreground. 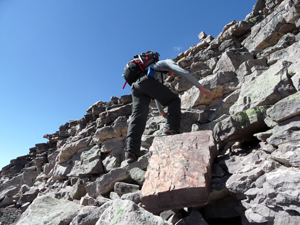 We're on the Gunsight Pass shortcut, where a climber's trail leads into the never-ending boulder fields. 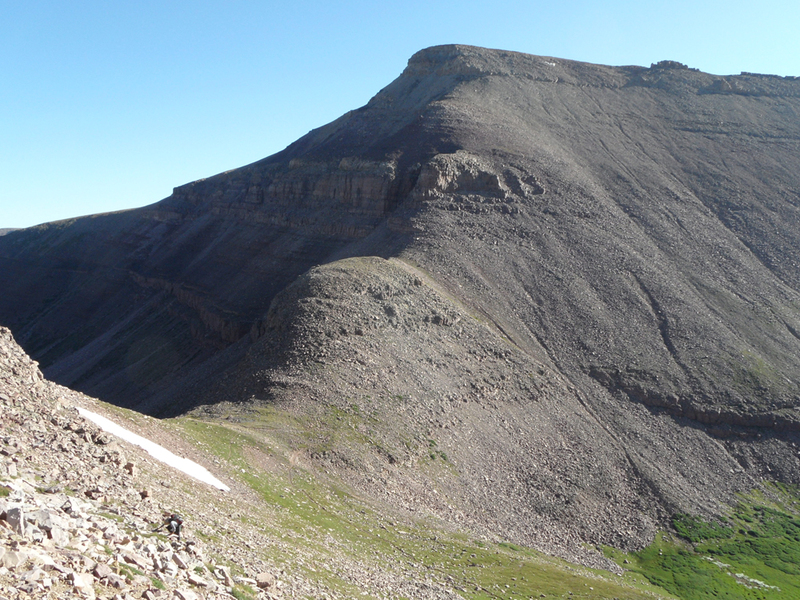 This section goes up and around the shoulder of West Gunsight Peak (shown below). 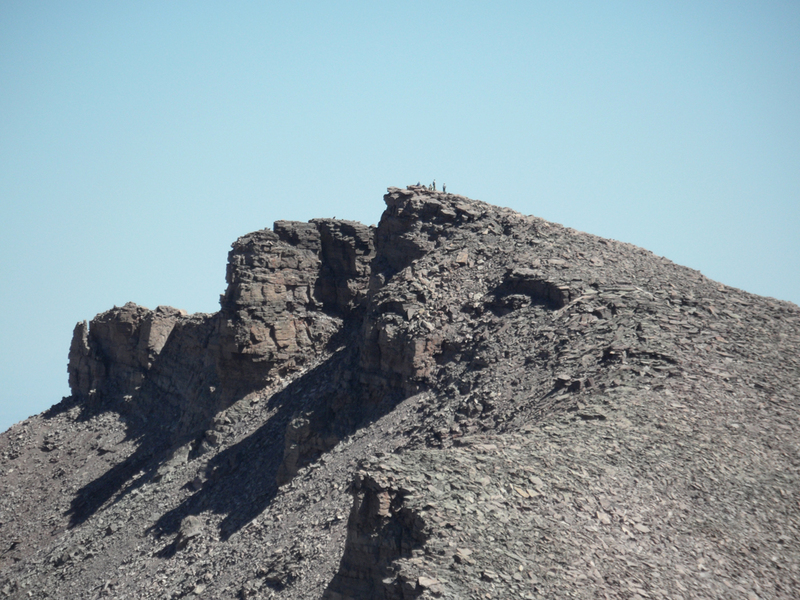 This is boulders, distinguished by size as much bigger than your garden-variety talus or scree. And not nearly as much fun. 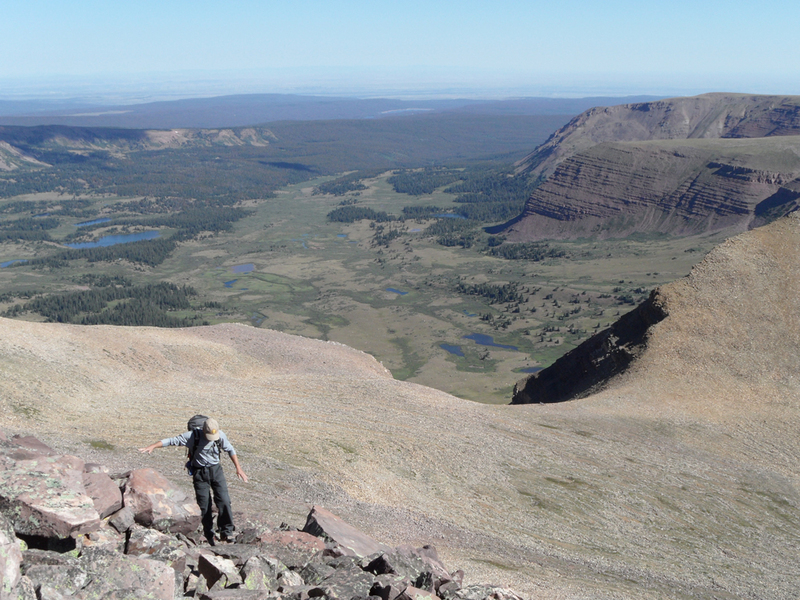 Once you've made it over the shoulder of West Gunsight, you get your first real view of what's in store. We're heading cross-country for a trail that takes you to Anderson Pass, the low spot on the right. Then up the ridge left to the summit. 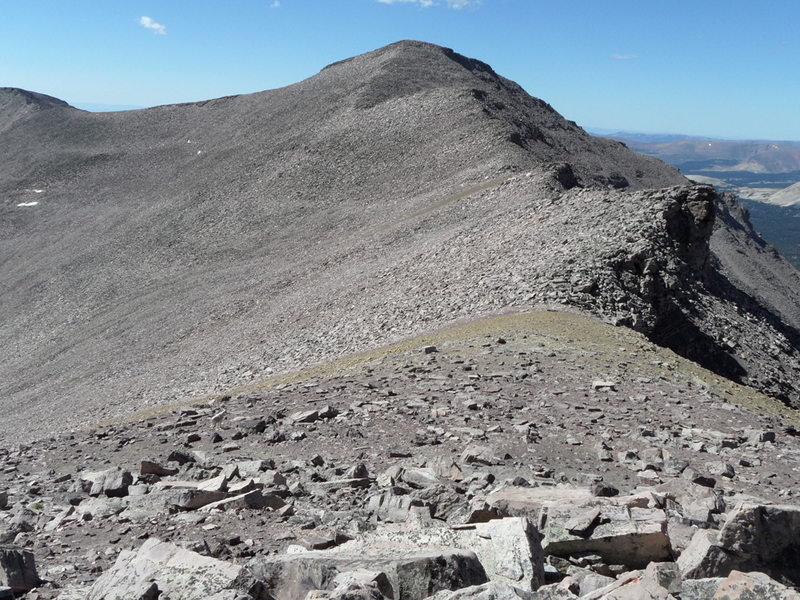 This is looking back at West Gunsight Peak. We have just completed the traverse, which goes across the endless boulders from the right of the picture to here. 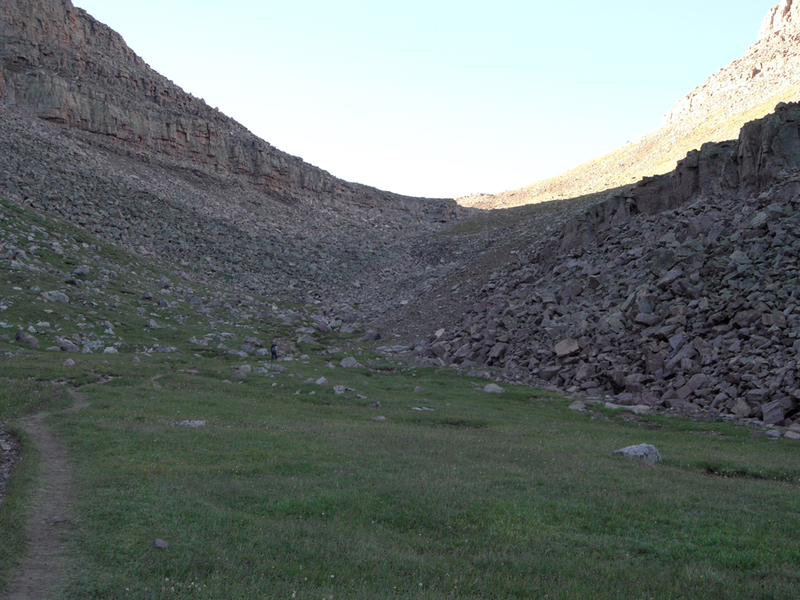 The dark notch in the ridge behind Bob is sometimes used as a shortcut back to the valley. 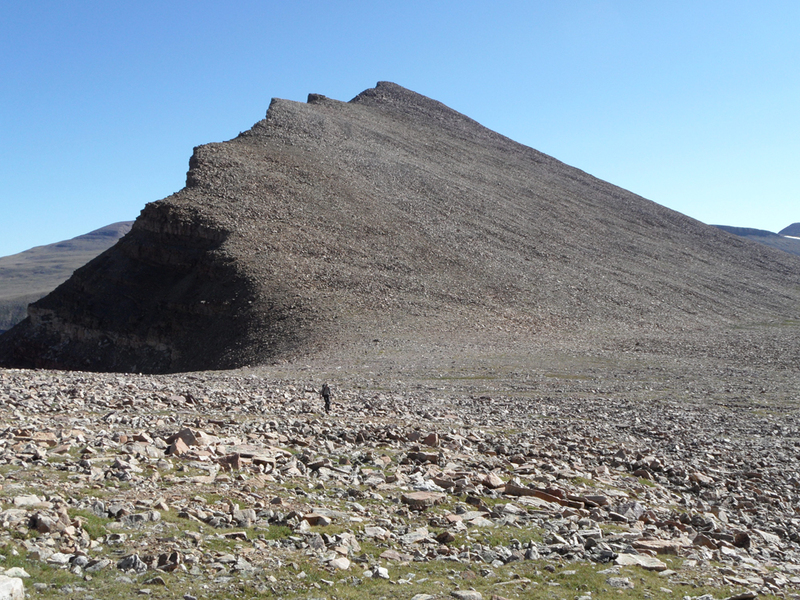 Due to its steep and loose nature, it has been dubbed the Toilet Bowl. Beta: On the return we found it much easier to go the low way around the boulder field shown here, even though it's longer and means losing some elevation. This is Kings from just above Anderson Pass. 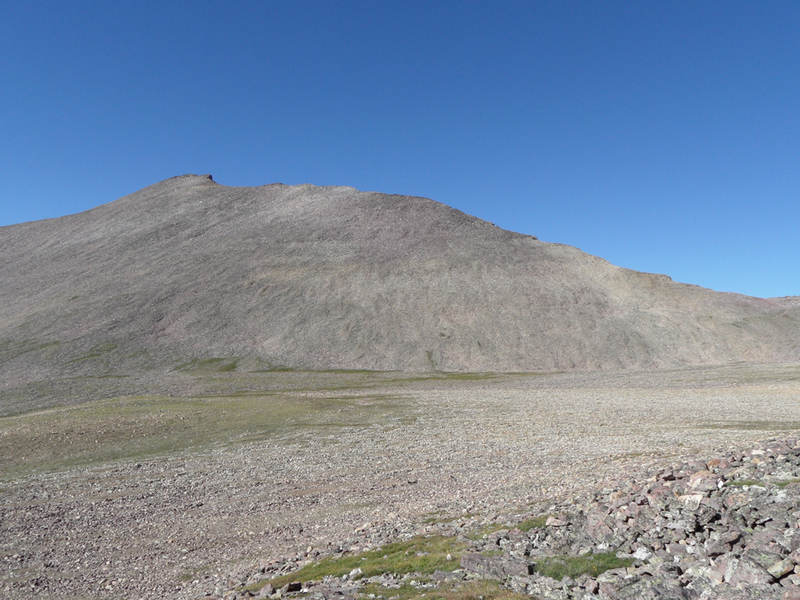 The actual summit is the rocky towers to the right of the false summit. On the far right is South Kings Peak. This first part of the ridge has an intermittent trail. This is Henry's Fork Peak. You can access it from Anderson Pass. Then it's just wandering about the loosely-stacked boulders. 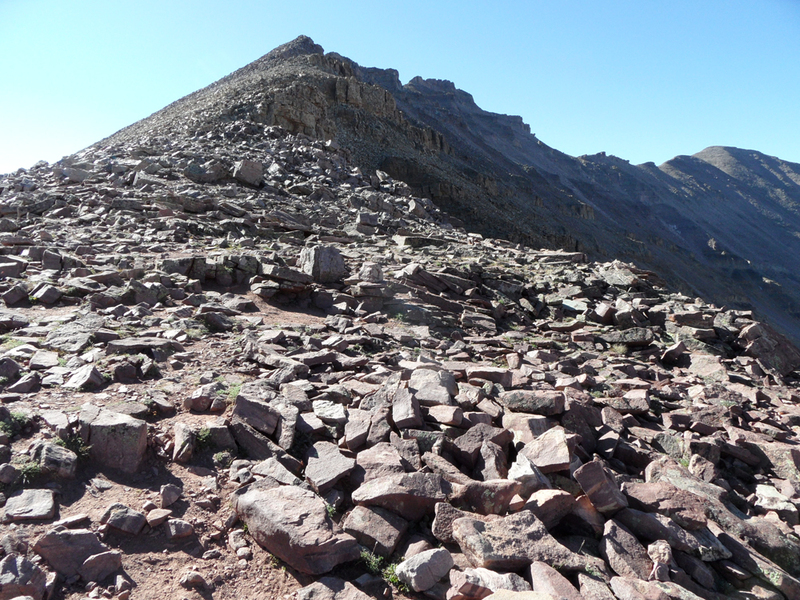 As you continue up the ridge, there are a lot more boulders. A lot. If you click on the picture, you'll get a movie (45Mb). Note the precautionary fist-smack. As you approach the summit, it levels off. Unless you go a bit too far. After about seven hours and 11.5 miles with 4300' gain, we were on the summit. Too bad the weather wasn't better. 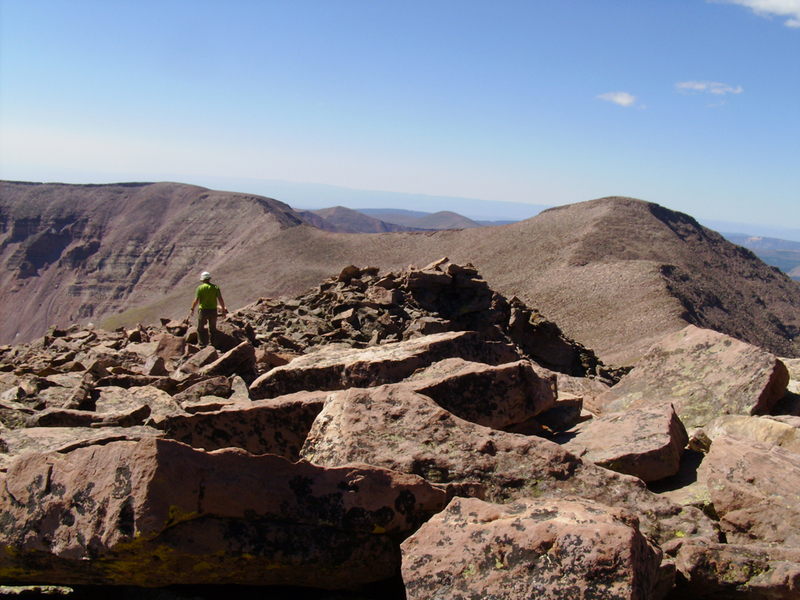 During the climb we had discussed several possibilities for other peaks in the area, but once on top Bob decided that he had had his fill of Uintah boulders for the day. So at his suggestion, I ran solo over to South Kings Peak, on the right. Note the boulders. In my absence, Bob took a nap in the sunshine, then chatted up new summiters as they arrived on top. This is looking back north to Kings. Meanwhile, I was checking out the local wildlife. 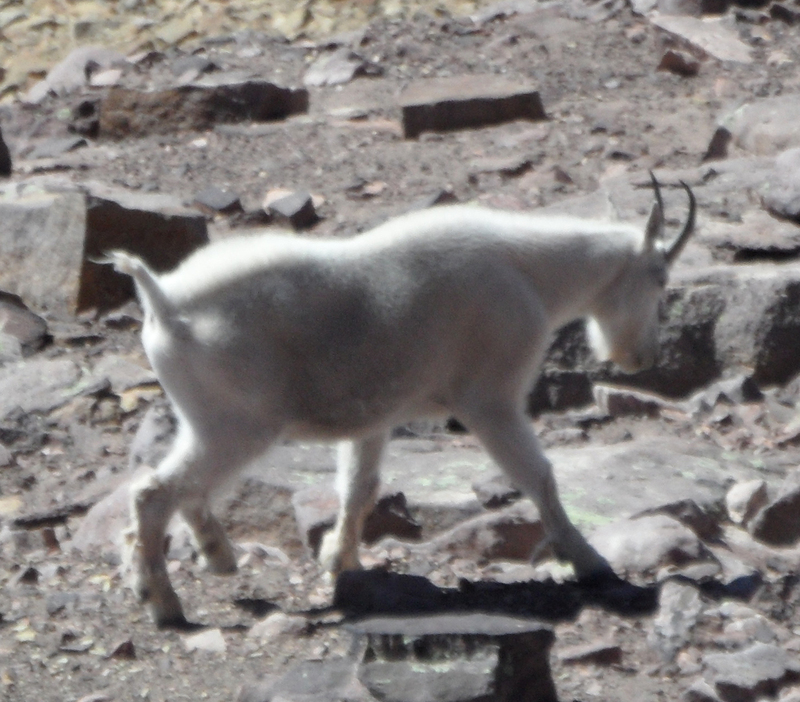 He had been looking right at me in the classic goat pose, but by the time I got the camera out, he was on the move. After dropping about 400' off Kings, here's the view of South Kings. More boulders. 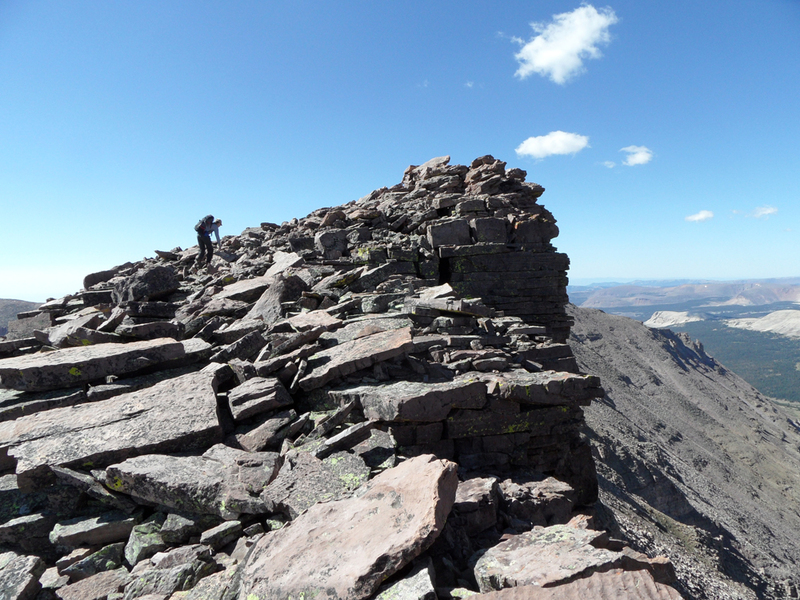 When I got back from South Kings, I was feeling like I'd had my fill of loose boulders. I was also feeling pretty blasted after going full-gas at 13000' for just over an hour. So we took a few more minutes rest and shoved in some food. Then it was time to hike the 11.5 miles back to the car. We left the summit at about 12:15. Here's a look back at our summit at 3:30. I put this picture in here for Julie. 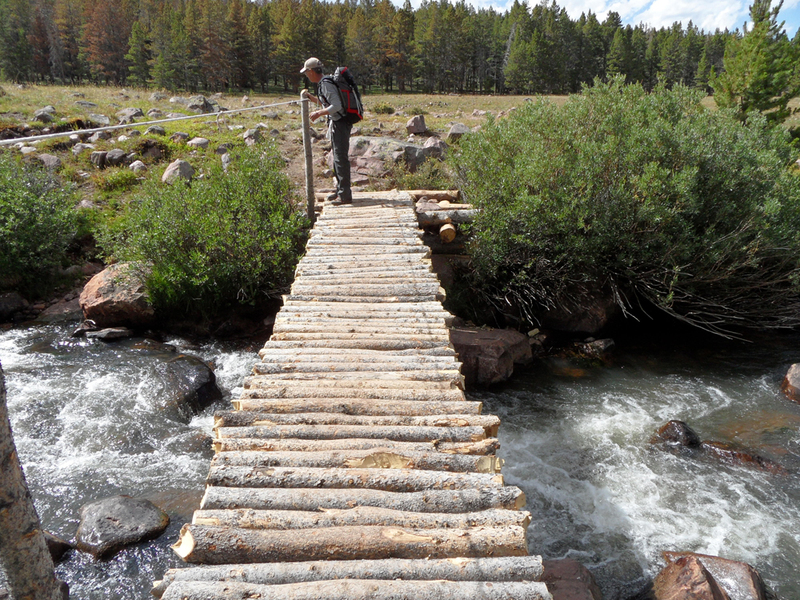 The old bridge was three lodgepoles tied loosely together with some rope, quite high above the creek. There were signs at the trailhead saying the bridge was out. That was true of the old bridge, but despite building this new one, the good ol' FS hadn't removed the sign. Such jokers.